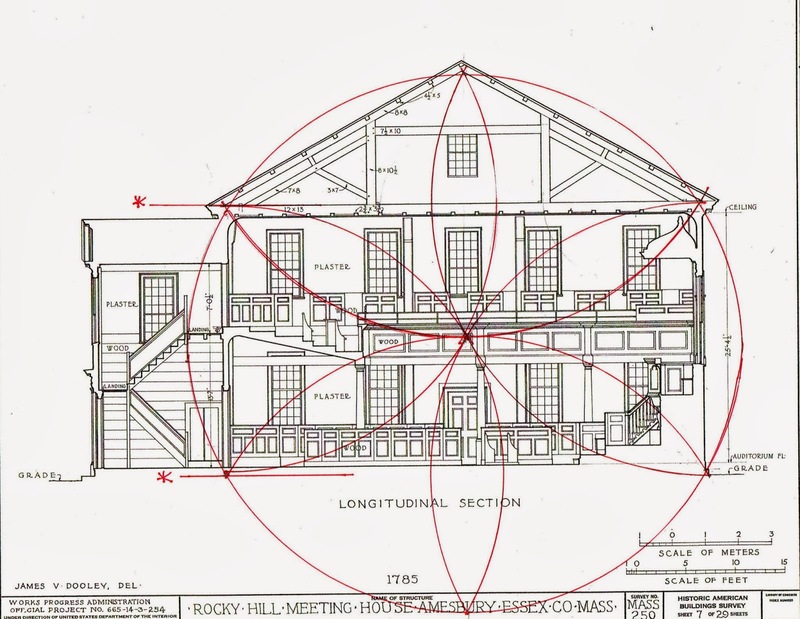 The Rocky Hill Meeting House was built in 1785 by the people of the West Parish of Salisbury. It was placed on ledge at the top of Rocky Hill on the road to Portsmouth, NH. By 1886 it belonged to the West Parish Society who, in 1942, gave it to SPNEA, now known as Historic New England. The church is now open occasionally for gatherings and concerts. In the summer of 2013, Historic New England offered a tour of the building led by their staff. A happy group assembled, delighted to look carefully at the building with knowledgeable guides. We were able to sit in the pews, speak from the pulpit, explore the balcony and climb the ladder into the attic to see and touch the trusses that clear span the sanctuary: 48'-9" outside to outside. We visitors came with many specific interests which led to excellent wide ranging discussions. 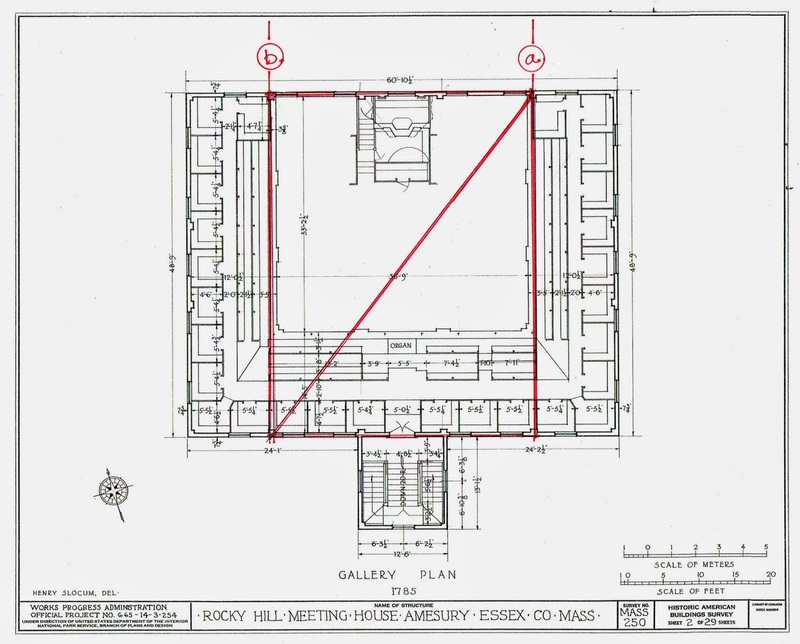 The drawings were available through HABS, so I, of course, began to consider how the meeting house had been designed. 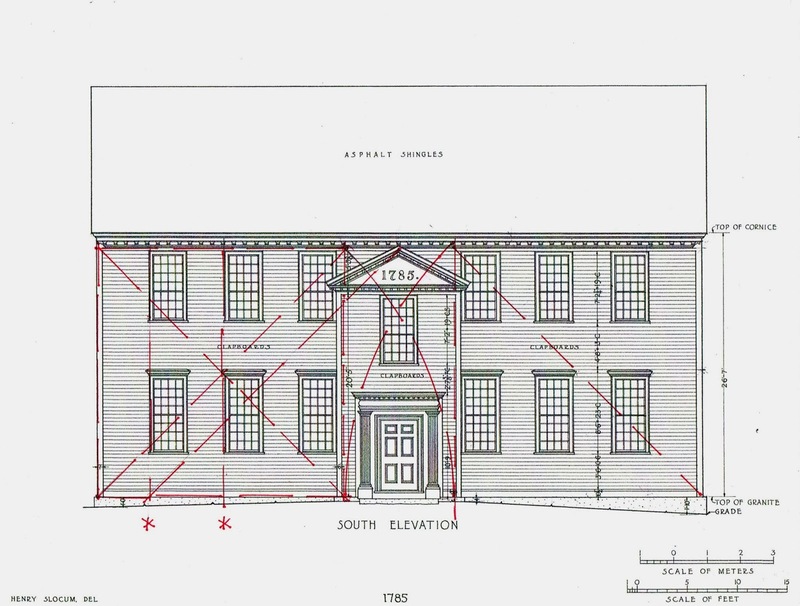 Here is how I think the building was planned, the dimensions and spacing determined. The committee knew about how big the building would be, that it would have a balcony and be set on ledge with no crawl space. The first dimensions would have been two 3-4-5 triangles, shown here, with the long sides ('a' and 'b') the location of the interior columns to support the balcony. For simplicity I have shown the balcony plan here. Remember that all diagrams can be enlarged by clicking on them. 2 squares were laid out, based on the sides. Here I have labeled the diagonals 'a' and 'b'. and drawn one square with solid lines, the other with dashed. 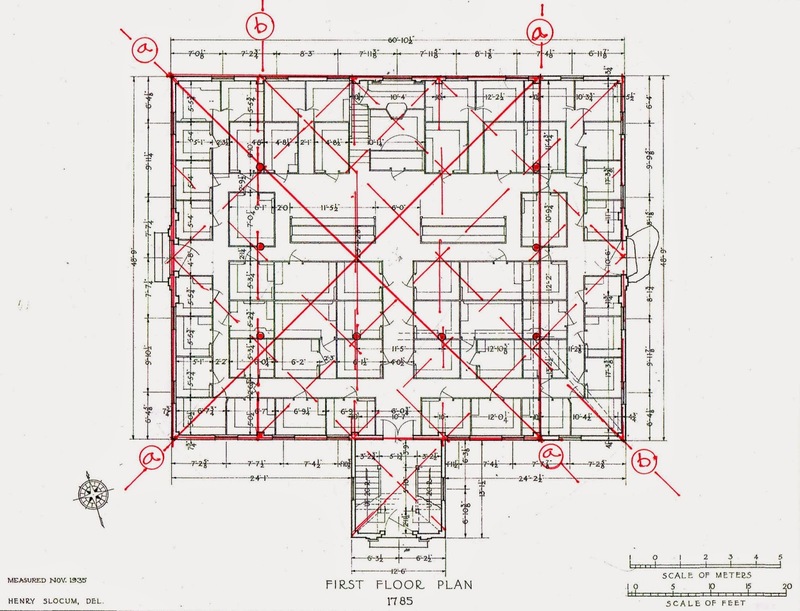 These overlapping squares determined the floor plan. I have drawn the multitude of diagonals that grow from those 2 interlocking squares. The side doors were centered, easily. The pulpit itself, is centered on the space, with the lectern - where the Bible sat - at the center of its square. Most of the columns fall on the crossing of diagonals. I think where some do not it is because of logistics. The columns which should be directly in line with the side doors would have made an awkward view and passage for someone entering there. The aisle would have needed to detour around the column - visually and physically unappealing. Similarly the columns near the back of the church, if placed on the crossings would have created box pews almost too small to be useful. This I know from personal experience, having sat in similar box pews. The entry 'porch' is also almost a square, a continuation of the pattern. It is about a foot too long. Again, I think the stair- which is quite steep with very tight landings - did not fit so the porch was extended. The section is the daisy wheel - circle geometry. Here the 4 side petals determine bottom side of the bottom plate, the top side of top plate (bottom chord of the roof truss), and the bottom of the ridge. The roof trusses were built to sit above the daisy wheel. The roof pitch is determined by the daisy wheel. The attic trusses are divided in thirds. The center of the determining circle is starred (*). It is the midpoint of the length of the daisy petal. It is also the top of the bottom chord of the roof truss. The radius of the circle I have marked in a thick red line. I did not draw the whole circle - you can project it. Note that the central tie beam falls on the radius of the circle. The front elevation follows the Golden Section layout that seems to have been popular at the time which I drawn in several previous posts. Here drawn in red, are 2 squares with their diagonals (The Golden Section) crossing in the center. It could also be 2 squares whose surrounding circles meet in the center, but it's not quite as neat. Note how the eaves of the porch bump into the windows. The porch is squeezed in... Maybe it was something the house-wright didn't think about very much until he had to build it. I think he is saved by the strength of the proportions - the eye doesn't catch it. I looked twice when I stood at the window in the balcony and saw the eave right there in front of the sash. If nothing else it is an invitation to rot. 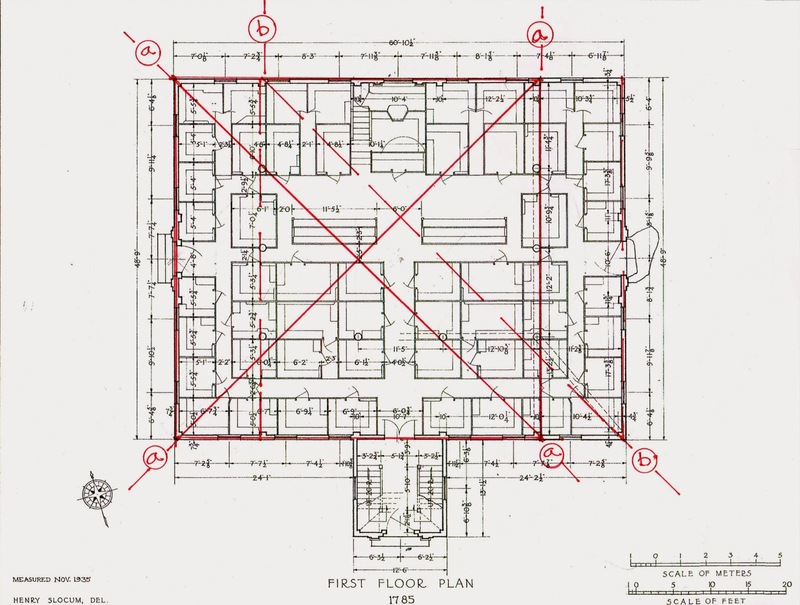 I was curious to see if the window placement might follow the layout of the overlapping squares used in the floor plan. At least on this elevation it seems as if it does. I have only drawn the left side. The center of the square on the left of the entry determines the left side of the center window. The square with its right side in the center of the porch - and center of the meeting house facade - lands at the left side of the farthest window. 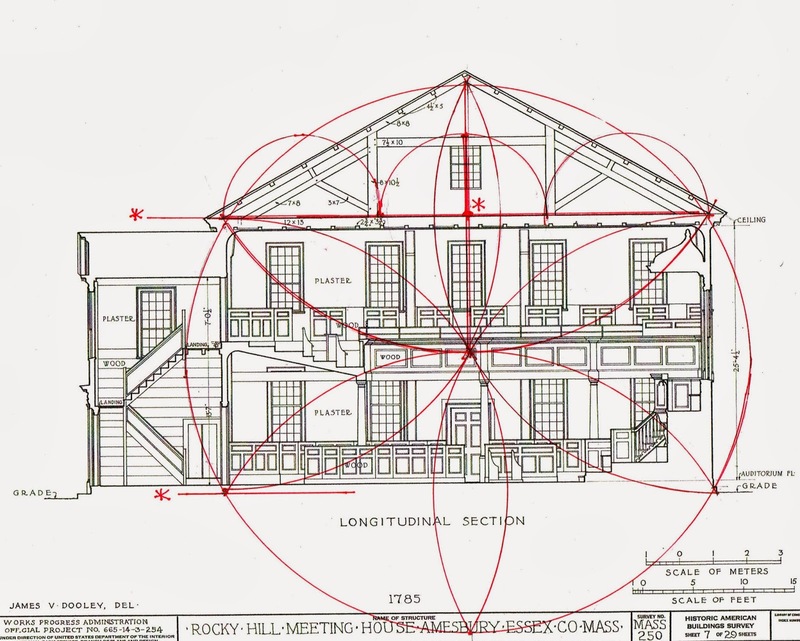 The master builders for the Rocky Hill Meeting House were Timothy Palmer and Ambrose Spofford. Palmer is also listed as the master builder for the Sandown, NH, Meeting House, built in 1773. He is thought to have built that pulpit which is quite similar to the one here. 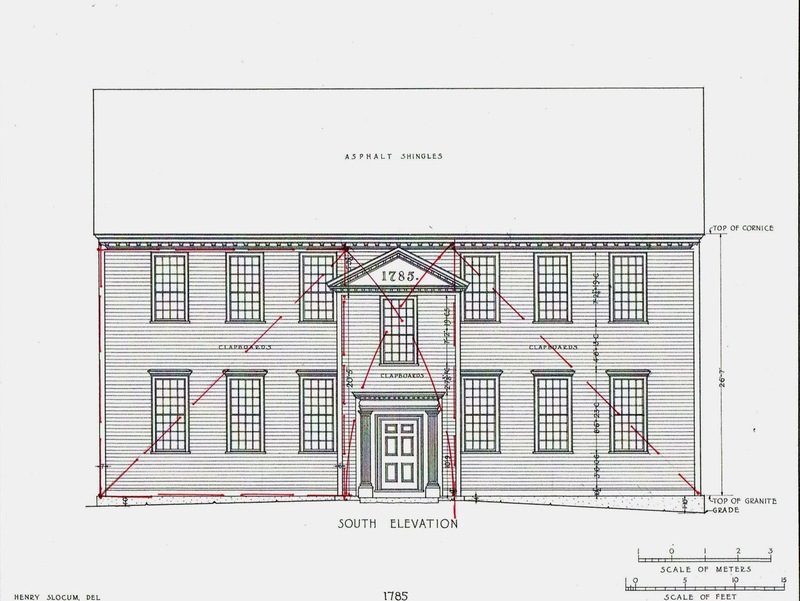 I am curious to see how that meeting house frame compares to this.